7. Works of the Ettrick Shepherd. 15. James Hogg: Anecdotes of Sir W.
6. The poetic mirror or. The living bards of Britain. From ragged cowherd to famous author, James Hogg's story is one of extraordinary social and professional transition. He was a man of contradictions: a partisan Tory with Radical friends; an upholder of oral tradition who eagerly embraced every new development in early nineteenth-century print culture; a man who wrote against biographical intrusions yet borrowed heavily from his life as an Ettrick Shepherd. 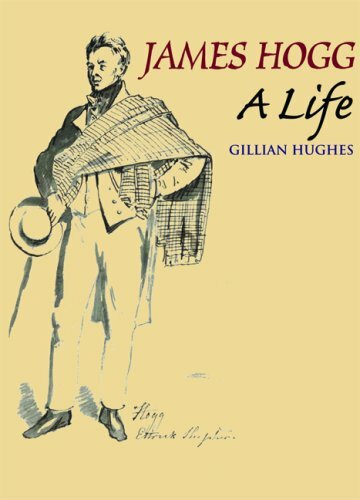 Hogg's formidable intelligence and drive were seldom acknowledged by his contemporaries, and his most challenging work was dismissed, but in this richly researched biography, the full scope of his life and talent is finally recognized. The Shepherd's Calendar, James Hogg, (ed. Douglas S. Mack), Edinburgh University Press, 2002, 287pp. This book is a paperback re-issue from the 1995 Stirling / South Carolina edition of the `Collected Works of James Hogg', and the overall package which it contains is almost too generous: thirteen short stories written by one of the world's greatest masters of the form, a literary introduction, an essay on the development of `The Shepherd's Calendar', a select bibliography, a chronology of Hogg's life (compiled by Gillian Hughes), extensive end-notes, and a six hundred word Scots / English glossary. The apparatus of any such work is of great value, but especially so in Hogg's case, as, with this book, we are getting for the first time in history, access to the stories as he actually wrote them, without the bowdlerising hand of editors. But of course, the book's real treasure lies in the stories themselves. They are divided into classes (although as the text now stands, enumerations are not always consecutive); the first deals with storms, the second with `Deaths, Judgements and Providences', the next few with dogs, lasses, and general anecdotes; then comes `Dreams and Apparitions', and the last focuses on `Fairies, Brownies and Witches' (a forte of Hogg's). The largest class, by a narrow margin, is `Dreams and Apparitions'. This, indeed, is hardly surprising given what most readers will already know about Hogg's deep and, for his time, remarkably modern insights in to the human psyche. But every section exhibits a charm and genius of its own. The book opens at a high level of excellence, with Hogg narrating a veritable meteorological history of bygone times, including a tale about a storm which he himself endured as a shepherd. In the next class, 'Robb Dodds' is a tale from oral tradition, narrated by the shepherd, Auld Andrew, of an unresolved mystery which has at its rootsthe cruelty of Tam Linton, and which ends in horror and retribution. Cruelty, and the vengeance it calls forth, is also at the heart of `Mr Adamson of Laverhope'; this takes as its subject matter a farmer whose egregious behaviour apparently results in his being struck by lightning, whereupon his bowels gush out, and his corpse collapses into what seems to be a ready-made grave. The `General anecdotes' section, though of deep interest, lessens the dramatic intensity of the collection with some interesting diversions, but here it is a comedy, `The Lasses', dealing with `Window Wat''s and `Jock the Jewel''s attempts to win the hand of the `bonny Snaw-fleck', that reveals best the complex machinery of Hogg's narrative technique. It is fitting that the next two tales, which are probably the most major, `George Dobson's Expedition to Hell and The Soutars of Selkirk', and `Tibby Hislop's Dream', come right at the centre of the collection. The former, indeed, is two tales in one, the linking device being the name of the central character. It refers to two different people, but since the blurring of identities (shades of `The Private Memoirs and Confessions of a Justified Sinner'), is a central concern of the tale's latter part, this form of artifice is again especially appropriate. In the opening, which draws upon an eerie tradition of the descent into the underworld, the real and supernatural realms impinge upon each other in a way that suggests the pervasive power of the latter; in `The Soutars', a contorted conundrum of events revolves around the prejudices contained in old Scots songs. `Tibby Hislop's Dream', which for me contains echoes of Henryson and Lindsay, deals with the gory end of the corrupt `Gibby Gledger', whose innards are devoured by birds. It is a `just-deserts' tale, par excellence, but read it for yourself. `Smithy Cracks', although it is suitably ghoulish, eerie and mysterious, is a rare tale in which the rational interpretation of events wins out over the natural assumptions of folklore. But `The Laird of Cassway', `Mary Burnet' and `The Witches of Traquair' decidedly place the emphasis again upon supernatural events. In `The Laird', the ancient tale of mortal enmity between two brothers, mingles with the Scottish witch-story; in `Mary Burnet', vengeance is visited upon a seducing rogue in a parable which is heavily reliant on the Scots ballads; and `The Witches', an old Catholic morality tale, complete with allegorical characters, uses genuine historical figures (George Wishart and David Beaton appear) to `earth' the fantastic firmly in Scottish soil. The climax of the collection, however, comes with the brilliant `The Brownie of the Black Haggs'. For those who do not know it already; it concerns itself, superficially at least, with the monomaniac obsessions of Lady Wheelhope, whose implacable hatred for an interfering brownie, the `evil Merodach of Babylon', knows no bounds. But in its sub-text, it explores sado-masochistic sexuality, in quasi-biblical language, and combines all of this with copious allusions to Scottish history and shepherd's lore. Given this brief for a creative endeavour, any potential short-story writer could be forgiven for thinking it an impossible task, but, evidently, not so the great `Ettrick Shepherd'. Hogg's use of Scots has been analysed before now, but it might be well to end with a reference to this feature of his writing. Hogg's Scots dialogue is of an exceptionally accomplished order, and there's no doubt that everything here is the `real MacKay'. His imprecatory registers are, by far and away, the most powerful, (although everything is authentic and natural). As Wattie says to Bessie, in a famous phrase: `... but nipping an' scarting are Scots folk's wooing'!. If ever you wanted `infinite riches' in a little book, James Hogg's `The Shepherd's Calendar' certainly comes close to containing them.